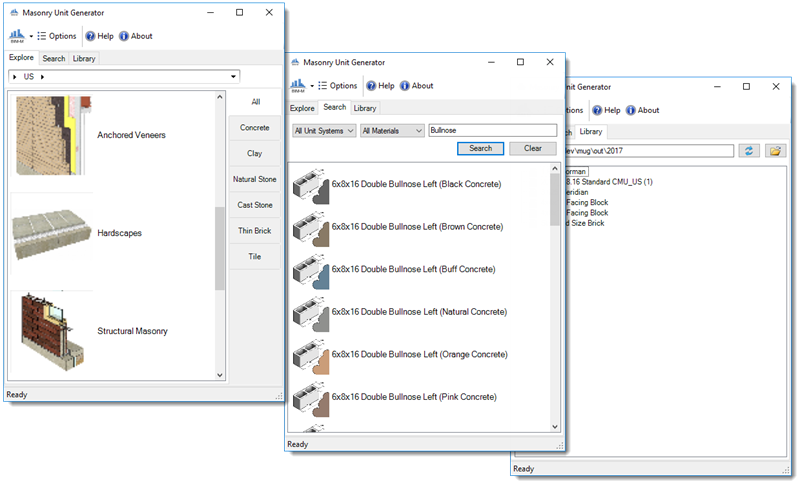 The Masonry Unit Generator add-in for Autodesk Revit is an application plug-in which connects to the Masonry Unit Database. 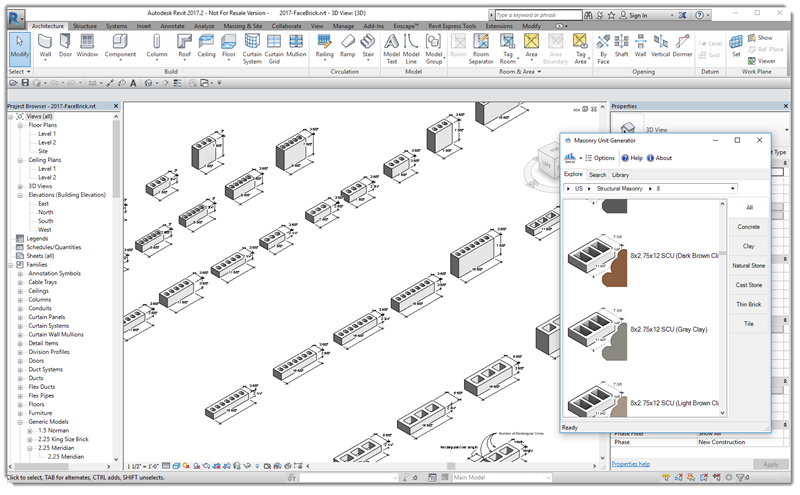 The add-in can generate accurate models to be used directly in your Revit designs. It features an intuitive interface, graphic representations of units, search capability and can save native Revit families to your library for later use. The Masonry Unit Generator add-in is compatible with Revit 2016, 2017 and 2018 (2019 and 2020 coming this spring). Revit LT versions do not support third-party add-ins. The setup program installs the necessary files into all of these versions, automatically. An internet connection is required to use the add-in. By downloading this program, you agree to the terms and conditions of the EULA (included). This version is provided by BIM-M for free use, as-is and comes with no warranty or guarantee of current functionality in future releases. Your feedback on this tool is welcome. Please send suggestions or issues using the help menu within the tool. The most current version of the Revit add-in can be downloaded for Revit 2016-2018 | Download the current version (2018 and below). The Masonry Unit Database has been prepared by CTC Software of Bloomington, MN, as a consultant to BIM-M.
CTC is a worldwide leader in building information modeling technologies and services. CTC Software provides tools, consultation and design technology solutions to the building, infrastructure, and facilities management industries.